Kai Skaggs is a senior at Canyon Del Oro High School. As the winner of the Sr. Strings Division of the 2017 Young Artists’ Competition, he performed a solo with the Civic Orchestra of Tucson (COT) that year. He has also played solos with Tucson Philharmonia Youth Orchestra and Sierra Vista Symphony Orchestra, and will perform a solo with the Southern Arizona Symphony Orchestra this spring. He is currently busy with college auditions. Andrew Nix, a high school junior, has played the violin for 14 years. He learned the viola specifically to play in this ensemble. He has played in Arizona All-State and Idyllwild Summer Orchestras and is currently co-concertmaster of Tucson Philharmonia Youth Orchestra. 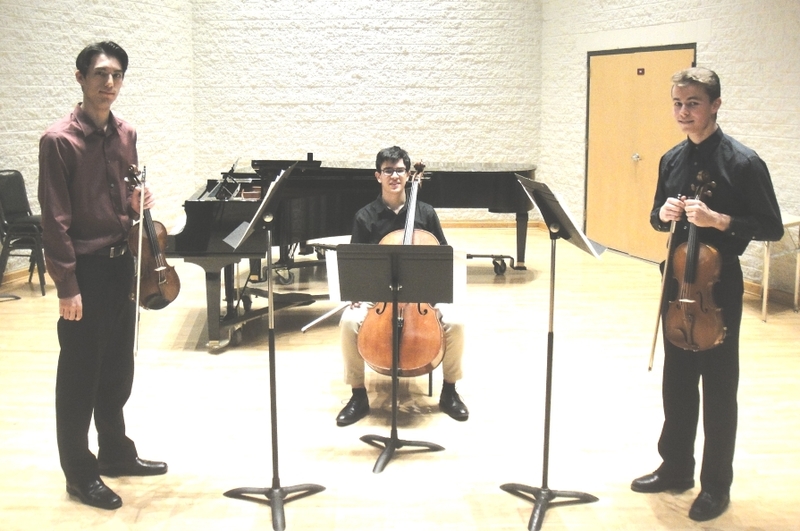 As Sr. Strings Division winner of the 2018 Young Artists’ Competition, he performed a solo with COT. Goals include auditioning for the National Youth Orchestra, New World Symphony, and eventually a prestigious orchestra such as the Chicago Symphony. Nico Miller, 16, is a junior at BASIS Tucson North. He has been studying cello since he was six years old. In 2015, he was named a winner of the Tucson Symphony Orchestra’s Young Artists Competition. Nico also enjoys playing piano, composing music, and reading classical Chinese poems.